This document describes how to build an IPSec tunnel based site2cloud connection between Aviatrix Gateway and Cisco IOS router. 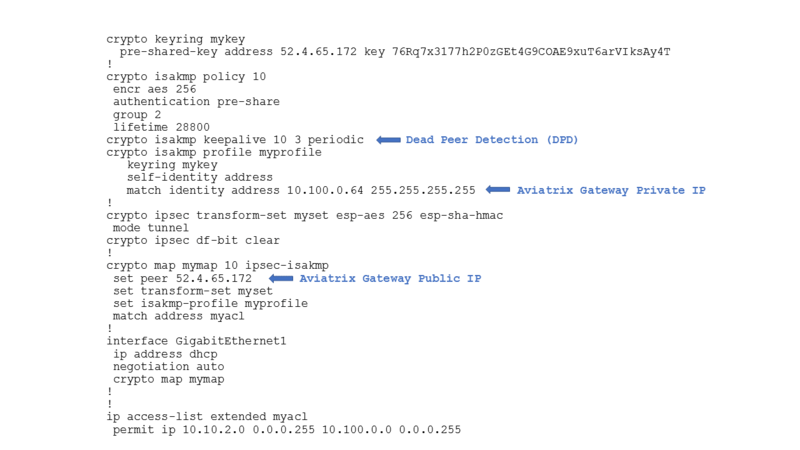 1.1 Go to Gateway->New Gateway to launch an Aviatrix Gateway at the public subnet of VPC-AVX. Collect Gateway’s public IP addresses (52.4.65.172 in this example). 1.3 Go to site2cloud page. From site2cloud connection table, select the connection created above (e.g. avx-ios-s2c). The following is a sample configuration based on the site2cloud configuration above. 2.1 Either ssh into the Cisco router or connect to it directly through its console port.